A day filled with beauty, love, nurturing of our spirits and a channeling of our hearts through our hands, connecting us to our ancestors and our Earth Mother. I offer the teachings of the drum that my Ojibwe Elders verbally passed down to me, with respect for those who passed along the knowledge of how and why to make drums since the beginning of time. 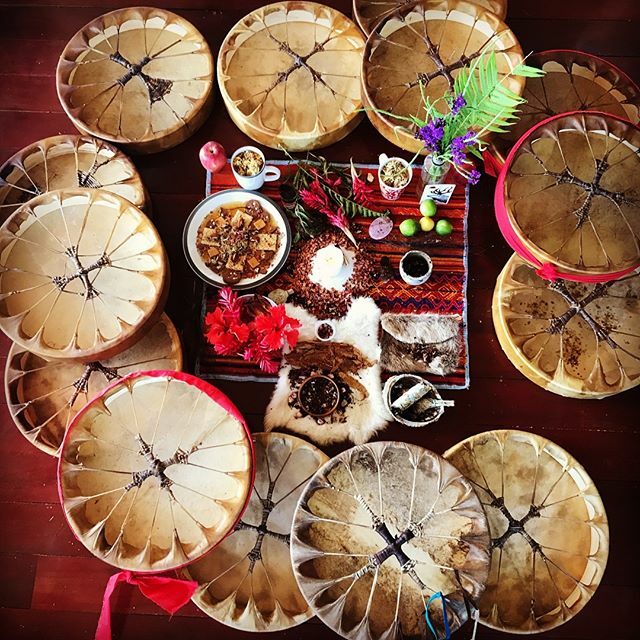 The sacred drums I assist in birthing, carry your own rhythms and vibrations as well as those of Pachamama, and by playing them you'll connect to her heartbeat. To make them, we only use carefully selected natural, raw or recycled materials with respect and reverence for the animals and trees provided by the creator. I personally cut all drum-heads and lacing by hand, always from the same animal hide as to not have opposing energies/personalities in the drum. All frames are handmade in British Columbia using only salvaged Yellow Cedar wood. The awareness, love and blessings going into the preparation of the materials for these sacred instruments, translates into the powerful medicine tools they become. As a final passage, I drum over each newly born drum to pass on the vibration of the linage of drums from the Ojibwe that has been passed down to each new drum for generations. These drums are made to last for generations. If well taken care of and respected for what they are, the next seven generations will be beating to the heartbeat of the Earth on the drum you created and brought into being. Imagine the power of that! Mia Luz lives in rural Pennsylvania and is a contemporary Medicine Woman, an Alchemical Priestess, Circle facilitator and a Drum-Doula. She is an Ojibwe Pipe Carrier and a mother. ***We will be making your choice of a 14", 16" or 18" round elk-hide drum with cedar frame and the mallet.